Steam Valve Original -a range of beautifully handcrafted taps that combine modem technology with retro styling, that are manufactured from solid stainless steel in Frome, Somerset, in the United Kingdom for JACLO industries. Jaclo Deck Mount Bridge Faucets from Steam Valve Original are made of stainless steel and mount above the counter like traditional faucets. Shop our selection of Jaclo SVO Kitchen Faucet Handle Options today! Jaclo Mono Block Two Handle Faucets from Steam Valve Original have a separate hot and cold control on a single hole mounted faucet body. Jaclo Steam Valve Original Pot Fillers are made of stainless steel and mount above the stove range for easy access to water. Jaclo Single hole Faucets from Steam Valve Original are made of stainless steel. Shop our selection of Jaclo SVO Faucet Components today! 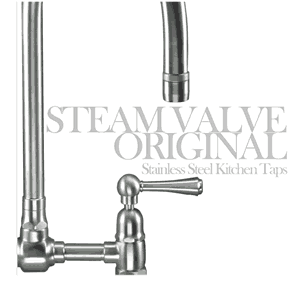 Jaclo Three Hole Deck Mount Faucets from Steam Valve Original are made of stainless steel. Jaclo Wall Mount Bridge Faucets from Steam Valve Original are made of stainless steel.